Check out this HOT deal on this Best Foundation Brush – Premium, Vegan Fibers. Rose Gold Short Handle Design By Andre Lorent Priced at only $6.99 was $27.88. CLIP THE 60% COUPON FOR LOWER PRICE! Ships Free with Amazon Prime! Your foundation brush sets the canvas for everything else. So doesn’t it make sense for you to use the best brush you can find for under 100? That’s what many refer to when they describe Andre Lorent’s flat kabuki brush to friends — the best brush you’ll get without breaking the bank. 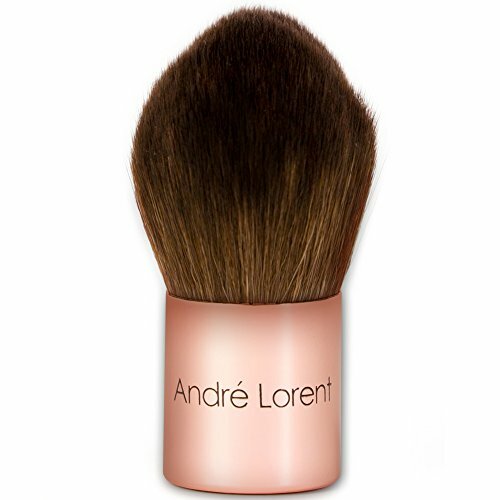 From famous broadway stars to makeup brush artists and all women in between – they rely on Andre Lorent’s LuxeFibersTM to easily and perfectly apply their foundation every time. Finally, you too can achieve that “airbrushed” look effortlessly. Dense enough to get the job done quick – yet soft enough to feel as if you’re brushing your cheek against a furry, fuzzy teddy bear. The best of both worlds! This brush is satisfying to hold and built to last for years. Shedding? Nope. That’s something cheaper brushes are known for. Vegan friendly? Of course! Plus it works great for any type of base – including cream, creme, lotion foundation and powdered minerals.